The tree trunks on the town common in Royalston, Massachusetts, are now bare. The blue ribbons that had recently dotted the landscape had to be taken down by Friday evening. "We have no hidden agenda here," said Kimberley Watson of Massachusetts State Police Wives. "This is just to support law enforcement, that's it. They've had a horrible year." Watson and the organization have been placing blue ribbons in communities across the state, in more than 40 cities and town so far. But they ran into roadblocks in Royalston when two local residents complained to town officials. "They said it wasn't the consensus of everybody in town," said Linda Alger, who sits on the board of selectmen. "That with all the controversy in the world, they didn't feel it was appropriate to post blue ribbons on town property." 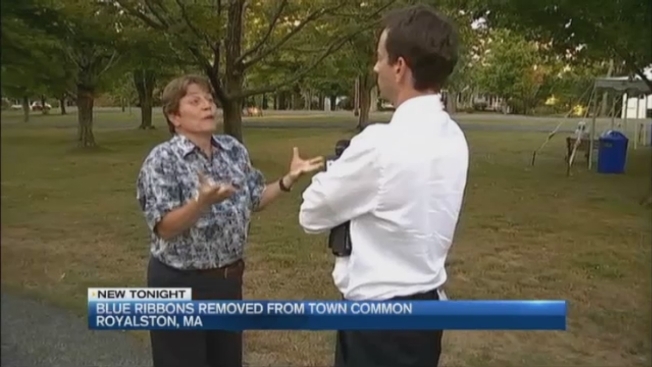 Alger says she's been threatened with stoning after voting to take down the ribbons. She says she supports the wives, but has to represent everyone in town, even if only two people voiced concern. "I wanted to show the support for my local law enforcement but people have passionate feelings," said Alger. The town told the wives to take the 60 or so ribbons down. Several local residents came to pick up the ribbons so they can display them on their own property. "Everyone is allowed their freedom of speech, that's fine," said Royalston resident Marie Lajoie. "I just feel there's a respect that was forgotten about." The group packed up their ribbons Friday, and they'll head for the next community on the list. "In this day and age, two people's voices overtake and overpower an entire town," said Stephanie LeBlanc, a member of the Massachusetts State Police Wives.